U Dělové Koule restaurant on the ground floor of the Hotel Jičín is a reminder of a sometimes overlooked facet of Jičín's character. 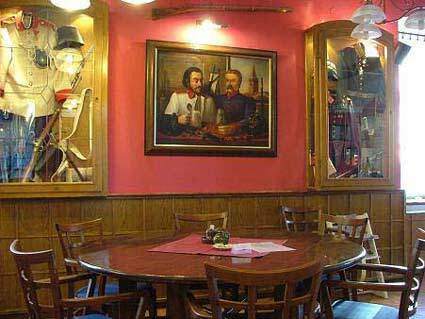 U Dělové Koule means At the Cannonball, and when you've had your fill of fairytales and rock formations, a meal here might just be the inspiration you need to delve into Jičín's role in the Prusso-Austrian war; specifically the battle of Jičín in 1866. In and around Jičín and at the entrance to the Prachov rocks are statues and memorials and cemeteries that preserve the memory/history of the battle between the Austrian army and their Saxon allies against the Prussian army. The battle lasted one afternoon, but took the lives of more than 7000 men. 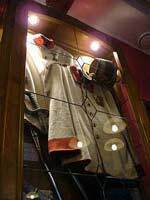 Purpose-built cabinets mounted on the ruby-pink walls display guns and swords and uniforms and helmets emblazoned with the almost forgotten symbols of Prussia and the Austrian Habsburg Empire. But if you're not interested in any of that and just want to eat, that's OK too. 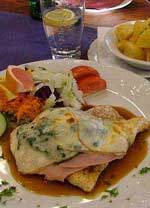 Distract yourself from the displays by focussing on the menu, which has an English version and offers, amongst other things, chicken dishes from 109 to 139Kč and fish dishes beginning at 139Kč. I had chicken with spinach and cheese, a side order of potatoes and a small bottle of mineral water, which left change from 200Kč. Smoking is allowed in the restaurant but seems to be gently discouraged. If you want to light up, you'll need to ask for an ashtray to be brought to your table. When I ate there everybody else was taking the hint and enjoying their meals in fresh air. The restaurant is open from 11am to 11pm Monday through Saturday and 11am to 10pm on Sundays. It's a good option for solid Bohemian food in refined surroundings at a reasonable price.